Made from Robust, Rugged Imported Nylon Taffeta Fabric with RUBBER Coating on the Fabric for Extra Water Protection. Soft to touch, Hard on RAIN. MACHINE WASHABLE too.. We're the Only ones using such a High End Fabric in this IndustryDO NOT use the Device until fixed on the Motorbike.Device is Theft PROOF as we're providing LOCK NUTS to fix it. Innovation is changing or creating more effective processes, products and ideas. When a young budding engineering student stated that he wants to contribute back to world , that too by means of INNOVATIONS, there were not many who took him seriously as India is perceived more as a tradition respecting country rather than technology innovating country. Today, Cyton MV PVT LTD is stepping stone for the vision of the very same Engineer, which also has earned the valuable "Start Up" status under Govt Of India's initiative. Cyton Mv Pvt Ltd has initiated the launch of innovative products, patented and made in India, all of them backed with hard work to ensure quality, durability and utility of the real world. The first product launch by Cyton , Bike Blazer cover, was launched at IITF 2017 and was the main attraction for visitors in trade fair - Innovation Pavilion, earning maximum footfalls. The launch was covered by media, both digital and print. National Daily News papers like The Hindu, Dainik Jagran and Dainik Bhaskar and INDIA TV coverage. 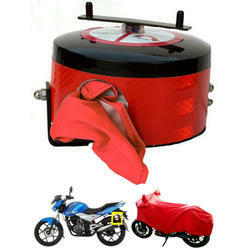 Cyton then on, commitment to continue Innovations at Cyton has lead to two more version of Bike Blazer cover's launch. We're PATENT holder & Manufacturer of INDIA'S only SEMI-AUTOMATIC VEHICLE COVERING DEVICES 'BIKE BLAZER' with Bike Blazer Devices you can cover your Car/Bike/Scooty in 8 seconds. Device attaches on the Body itself & stays with the Vehicle. Startup’s VISION; To Solve Daily problem Faced by Mango People with Simplest, Innovative Inventions & Cash on it (NICHE MARKET = REAL MONEY) Btw, there are more than 7 Billion Mango people on Earth.